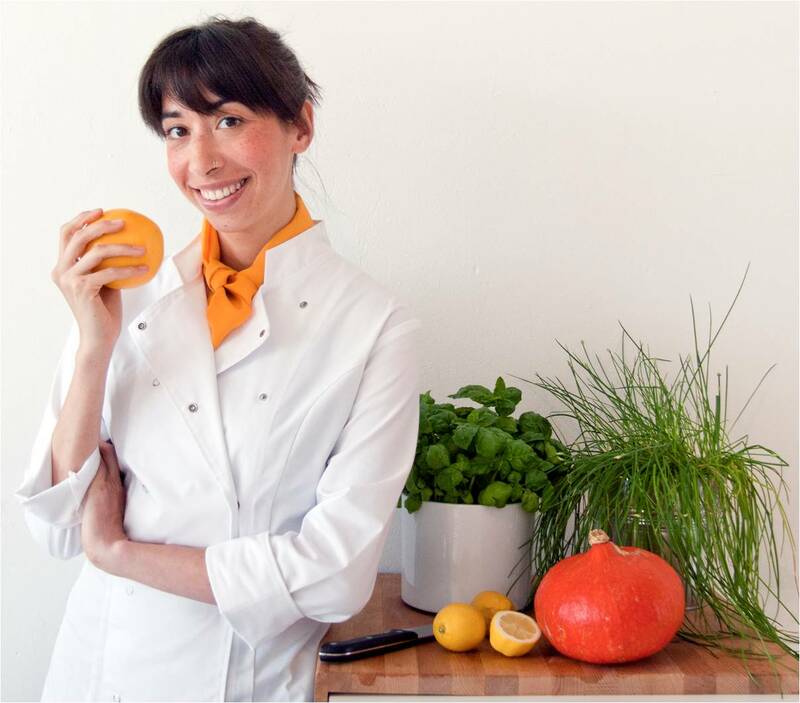 Hi, I’m Olive Aguas and welcome to the Bee’s Knees Kitchen, the raw food blog aimed at discovering healthy, simple recipes to satisfy your sweet tooth and hungry belly! Growing up in Oregon, good food was a part of everyday life. I come from a family of passionate foodies and many of my early memories are infused with flavors and scents of food being cooked in the kitchen, rich with the bountiful ingredients of the Pacific Northwest. A few years ago I started to explore the world of raw food and this blog was created as a result of my desire to chronicle this journey. Living in the heart of Western Europe, I wanted to share my recipes with family and friends back home. My aim has always been to create healthy meals and desserts that use the same basic ingredients and are easy to prepare. I also believe that eating raw food should be a sensual and mouth-watering experience – no rabbit food here! I always take my inspiration from fresh, seasonal produce and as a food addict I’m constantly exploring new flavors and creating interesting and unique dishes to satisfy my keen palette. Welcome to my kitchen – pull up a chair, grab a plate and join the conversation celebrating food that’s nutritious, delicious and beautiful. This blog was such a great find for many reasons. The recipes are laid out for some of us who are kitchen challenged. The pictures leave no surprises as to what you should have when completed. Last but the most important is that everything tastes great for a person like me who tries to eat healthy but stumbles some days. Thank you for such a great lay out of great recipes, beautiful photo’s, and making it soooo easy to prepare food that isn’t full of junk. I love it that you use a few central ingredients so that I don’t have to go out and buy tons of different things just to make something I won’t make again for awhile!! Have you ever considered allowing a local bakery to sell your creations under your Bee’s Knees name? Wouldn’t that be cute? I love your blog. Your pictures make everything look so good , your presentation of each recipe make me want to try them all. Also I want you to know since I had to have a tumor removed from my stomach at the end of April, I can eat only certain things. Your blog has helped me lose 20 lbs, just eating fresh or steamed. To bad you are so far away because my garden is full of fresh vegtables and I would love to share them with you. I too love to mix all sorts of greens and fruit for a healthy salad, plus I now have a bee hive that will be providing fresh honey for my sweet tooth. yummmy happy to have found a rawfoodie in Germany 😉 who writes in English ,-) Have a wonder full week. LOVE your blog, I found it on GoneRaw.com and literally have tried a large handful of your recipes these past few days! I cannot wait to try more! I have featured your lemon icebox cookies on my blog! haha They were amazing by the way! Cannot wait to try more of your yummy treats! These are such beautiful pictures and the ingredients look fabulous! I am so excited that you are doing this! I’m keeping this website close to my heart (and stomach!). nice to meet you at the potluck last week! Deine BeesKneesKitchen Rezepte sind einfach ganz große KLASSE, ich bin total begeistert. Übrigens, “Green for Life” von Victoria Boutenko gibt es jetzt endlich auch in deutscher Sprache. Love your blog! Gorgeous desserts that look absolutely divine and approachable!! I continue to love your site! I haven’t yet made it to trying one of your recipes (sadly) but I will soon! I just haven’t decided which one! I am thinking the lemon cookies, but then I see the lime pie, with avocados, which I LOVE, and all the other fantastic ingredients in all of your recipes and I can’t choose!!! Good thing you use a lot of the same central ingredients, as I mentioned before, and it wouldn’t be hard to try one, two, three, or all of your recipes!!! I soooo enjoy your posts. Thanks so much! You have a beautiful family as well. God bless you all and thanks again! I’d like to try out your recipes, they look so tasty & healthy. Your instructions are also written very well. I haven’t tried raw food cooking before, but I’ll do my best. Thank you for posting! Deine SacherTorte war sooooooo lecker! Leider habe ich Dich beim Rohkost-Brunch am Sonntag nicht persönlich kennen gelernt! Wirst Du das Rezept von Deiner super Torte veröffentlichen? Ich lese sehr gerne in Deinem Blog und lasse mich inspirieren von Deinen wunderbaren Rezepten! Die Fotos sind wunderschön, Du auch! freue mich Dich beim nächsten Potluck zu sehen! I just found your blog and I love it so far. Love the recipes i have been scanning. I look forward to following you and trying some your recipes. I have been really trying to go at least 70% raw and this is going to be huge help. Hello Carla, I just found your blog and I’m loving it! such a wonderful recipes and pictures. I also live in Germany…..do you find it hard to eat out? And do you know of any “raw restaurants” in Germany? I have been raw for the past couple of months and am also starting to document my journey as I feel so passionately about this way of life….it’s hard to remember what was good about meat/eggs/flour and cheese in the first place. My body/mind and spirit have never felt so united. Love and light and happy travels. How fun! I would love to join the French pastry course, but I am in Hamburg. However, next time I am in Amsterdam, I am going to take a look at upcoming courses!